Sarawak offers unique CSR programme that allows you and your team to spend more time helping to provide a better future for others. You can also start making your meetings green? Here are a few tips. Sarawak offers unique CSR programme that allows you and your team to spend more time helping to provide a better future for others. Today, CSR plays important roles in promoting a warmer image of an organisation. Having goals and a vision of the organisations that go beyond products and profits by actively participating in CSR programmes is part of a friendlier image of an organisation to their clients and the general public. Organisations can choose how they want to be involved in a CSR programme on whether to provide funding and resources for worthwhile social causes, such as donating money or employee time to charities, or putting together a real plan to produce products or provide services that are in the best interests of the society. These include things like using safe materials in design and manufacture, corporate environmental initiatives, and other factors such as job creation and economic development. The most successful corporate social responsibility programmes integrate both ways of CSR that shows a true commitment to a cause. For example, a company that uses sustainable materials in their products, donates financial resources to environmental causes, and allows employees to take paid time off for volunteering at environmental charities would be showing a true commitment to the environment that goes beyond any single CSR initiative. For any of your choices, we can help you by either creating it from scratch to fit your organisation’s objective, such as being part of a long house community or a remote village and working hand-in-hand together with the local people in constructing much needed facilities, such as medical clinics, school buildings, bridges and many more. You will also get to learn about paddy planting, catching fish in bamboo traps; trying to create your own masterpiece of the local arts and crafts; and taking part in local entertainment with traditional music, games and dance. 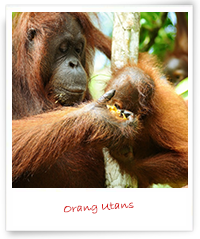 The orang utan is a much-loved international icon of the rainforest. Highly endangered, irrefutably rare and as intelligent as a small child, this species is found only in Borneo and Sumatra. Wildlife conservationists have been fighting against the extinction of this species for decades. Try out a day in the life of the unsung heroes who sacrifice time and effort to bring these gentle giants of Borneo’s forests back from the brink of extinction. Get down and dirty with the orang utan keepers at Matang Wildlife Centre and share a day of joy with these intelligent, soulful animals which were once found in abundance throughout Sarawak. In order to build the organisation’s brand and visibility, social media is used to promote the organisation’s social responsibility activities. It creates a positive branding image and allows the organisation to engage with the audience on a deeper level beyond its products and services. Public relations is crucial in developing an organisation’s image and how others will perceive it. Organisations that publicise their social responsibility activities through the media are one step closer to powerful branding, media publicity and contributing to the development of local communities. Organisation’s that practice CSR have a better experience in dealing with politicians and government regulations. As opposed to businesses that lack CSR programmes often find themselves being questioned and probed by public service organisations. CSR projects a positive public perception towards an organisation and is less likely to face inquiry from competing organisations and governmental bodies. Among the benefits of exercising social responsibility in the workplace is the positive energy it builds for the team. Employees will feel more enthusiastic and engaged in their work, knowing that their organisation is also working towards a greater cause. This in turn builds teamwork and camaraderie amongst employees, leading to a more productive and happier organisation. CSR is a commitment that works best when it comes from the heart. At SCB, we encourage your organisation to put in the time and efforts required to reap lasting and meaningful rewards in social responsibility activities. Look at CSR as a win-win situation; a win for your organisation, and a win for the communities you help.